Restriction enzyme cutting DNA. 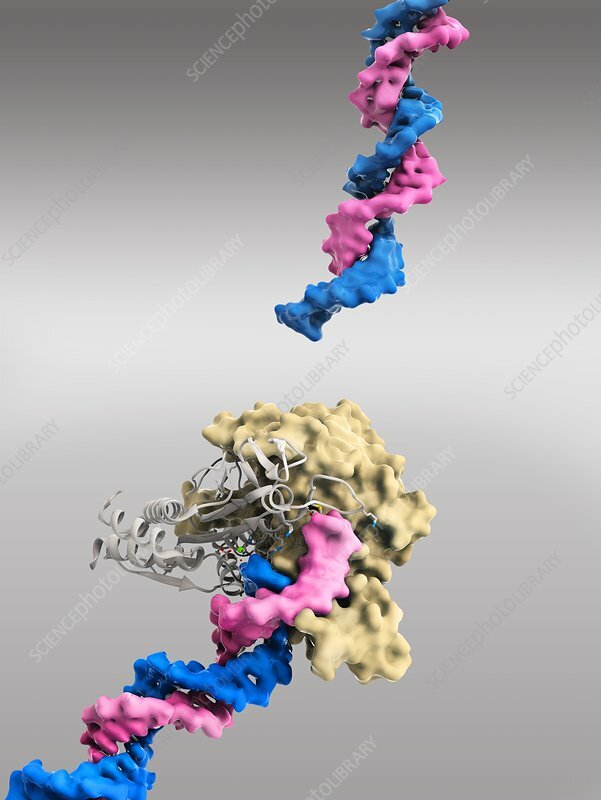 Computer model showing an EcoRI endonuclease enzyme (green and ribbons) cutting a DNA (deoxyribonucleic acid) strand (blue and pink). EcoRI is an enzyme isolated from strains of E. coli bacteria. It is part of the restriction modification (RM) system used by bacteria to protect themselves from foreign DNA, such as that used by bacteriophage viruses. It is used in molecular biology as a restriction enzyme - an enzyme that cuts DNA at specific recognition nucleotide sequences known as restriction sites.